It’s the month of November and y’all should know what that means! It’s time for MOVEMBER!!! And it’s not just for men (obviously, otherwise why am I writing this?). Women can sign up to support the cause by becoming a Mo’Sista. Which is what I’ve done and it’s my second year in a row doing it. Last year I raised over $100 for cancer research and this year I want to go even higher. I’m doing this for all the men in my life, but in particular, a few very close male family members who have fought the good fight against cancer (you know who you are – I love you!). I’m also doing this for the women in my life – because regardless of what type of cancer you may have fought, every cancer is bad. And there are some very very close women in my life who have battled this foe (some have won, and some have lose). This is for all of them. And all of you. Support. Whether that comes in the form of sharing my page on Facebook or Twitter or through emails to friends or whether it’s in the form of a $1 donation – every little bit helps. You can find my public Mo’Space here. At that page you can comment on my page and give me shout-outs, you can find Share buttons to promote my cause, and you can also donate directly to me (the donate button is right under that awesome photo of me with a moustache). What else can you do? You could sign up as well! Whether you’re a Mo’Bro or a Mo’Sista, you can join the site and support the cause. You can find out more about the whole Movember movement and where the funds go by checking out their about page. To wrap up this long-winded post, if you can, please donate even $1 to my mospace page – it’ll go a long way. If you can’t, I totally 100% understand and ask only that you share this in any way you can, whether it’s online or through word of mouth. I’m taking this campaign and running with it this year and I need your help. Have ideas for me? Want to tell me I’m awesome? 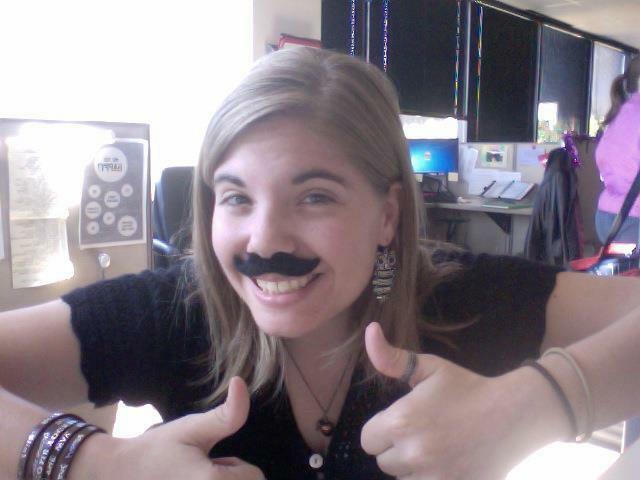 Want to tell me I’m ridiculous-looking in a moustache? Comment and let me know. I’d love to hear any feedback you may have. 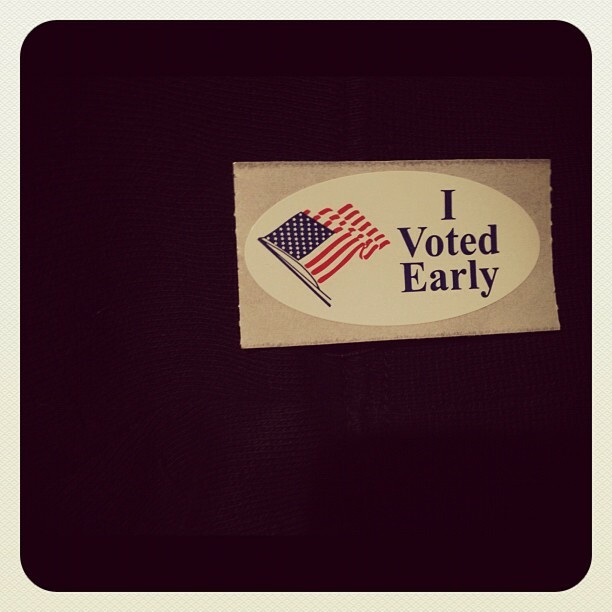 Remember, Remember, OUR 6th of November – Go Out & Vote! Today is Voting Day here in the US. A lot is riding on this election. A LOT. From finances, to medical bills, to gender equality to civil rights. It’s an important election. Here are a few thoughts I jotted down last night before going to sleep. “The closer we get to tomorrow, the meaner and more cruel people on Facebook become – on both sides. I’ve started blocking quite a few people from my News Feed because I’m sick of the hatred being thrown around. Stop talking and act. Go out and Vote. Stand up for what you believe in. Do good, live your life well. That’s what counts. Don’t get mean. Love. As for me, I’ve just had to stop thinking about tomorrow. You all know my side. You all know who I voted for. You all know who I love and what I stand for. Regardless of who wins, the aftermath is going to be filled with angry, hateful people. Regardless of who wins, remember this. We’re all humans. We all have responsibility. We all have a commitment to this earth and to our fellow people to put as much good into this world as we are able. We are all still Americans. We are citizens of Earth. We are pieces of the same universal stardust that make up our existence. We are the SAME. 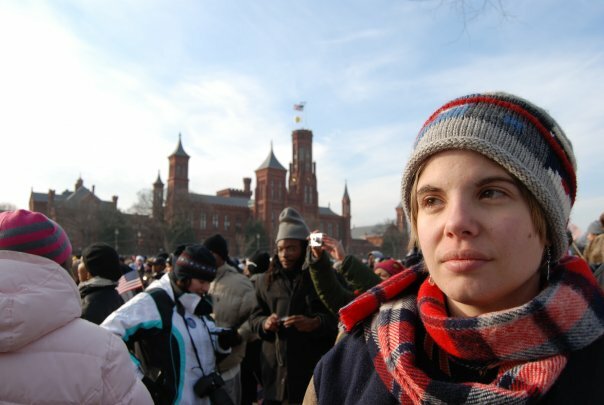 Me in January 2009 on the National Mall waiting for the inauguration of Barack Obama. No matter what happens, I will continue to fight for what I believe in.